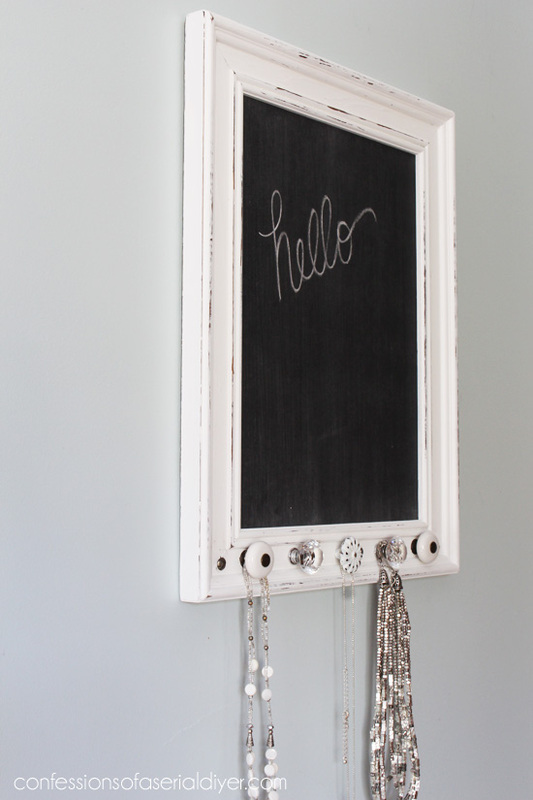 Seems like a perfectly good day to share a little thrifty upcycle, don’t you think? 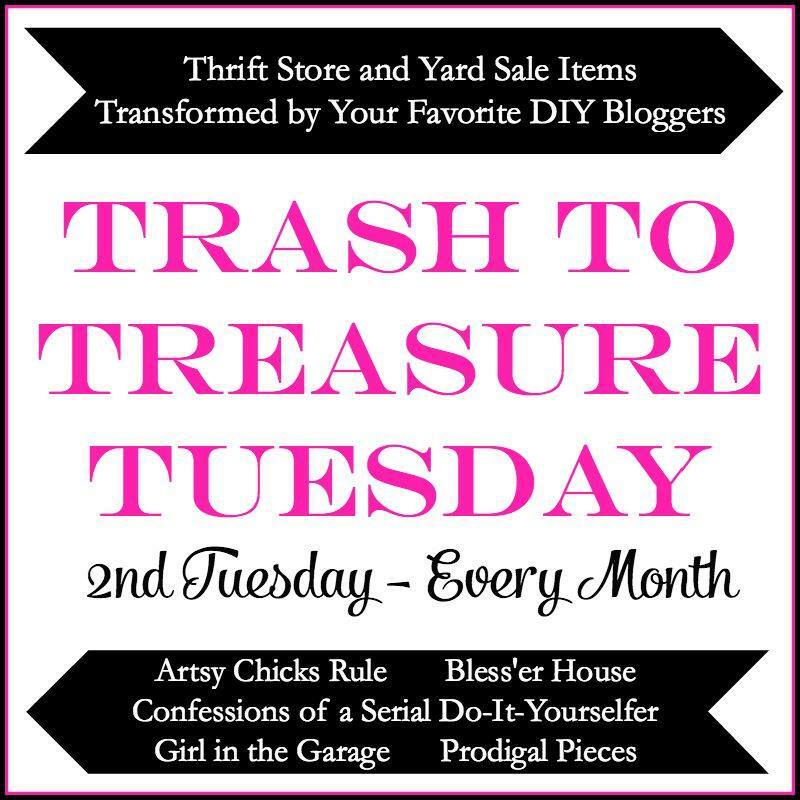 It’s Trash-to-Treasure Tuesday so make sure you stick around to see four other fabulous upcycles from my talented and thrifty friends, at the bottom! 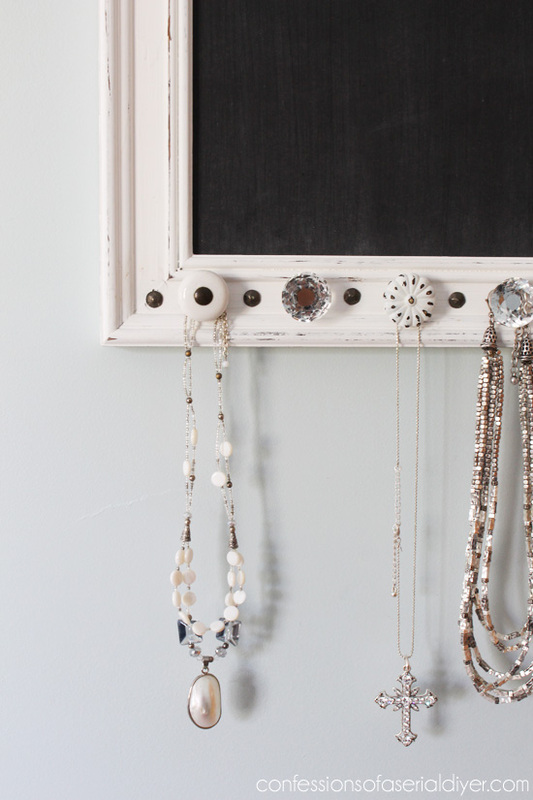 It’s a chalkboard and a place to hang your favorite necklaces…or lanyards…or whatever else might fit on a small knob. 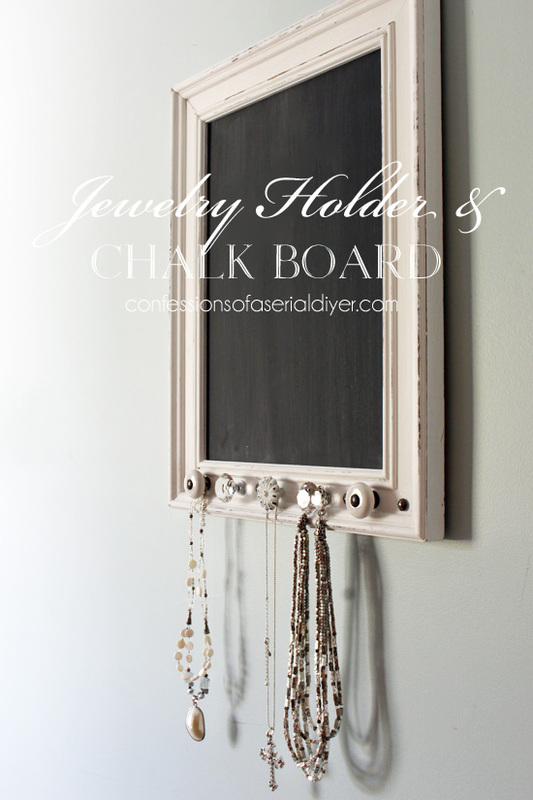 Have you ever made a chalkboard before? If you haven’t, it is so simple. I make and sell a ton of them, but rarely share them because it would be a lot of repetition. 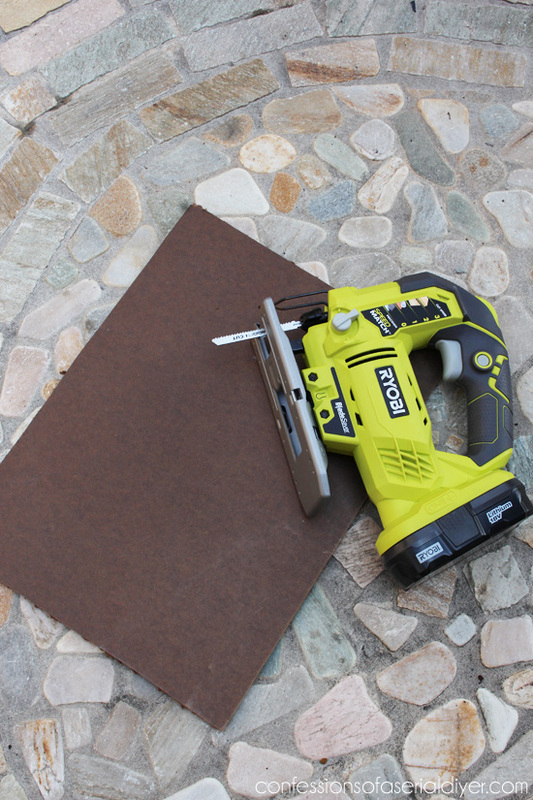 I use hardboard to make mine. 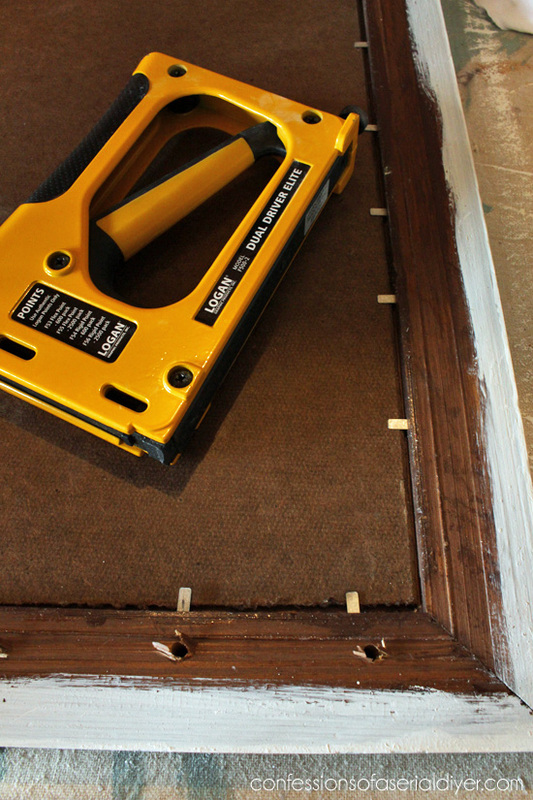 It’s like pegboard, but without the holes and I get it from The Home Depot. 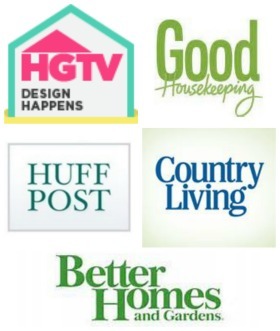 I’ve included affiliate links so you can see the products I’ve used. Read my full disclosure here. If I’m making several, I will use my table saw. The helpful people at Home Depot will also cut it to the size you need if you don’t have a saw at home. This is the best one I have used. 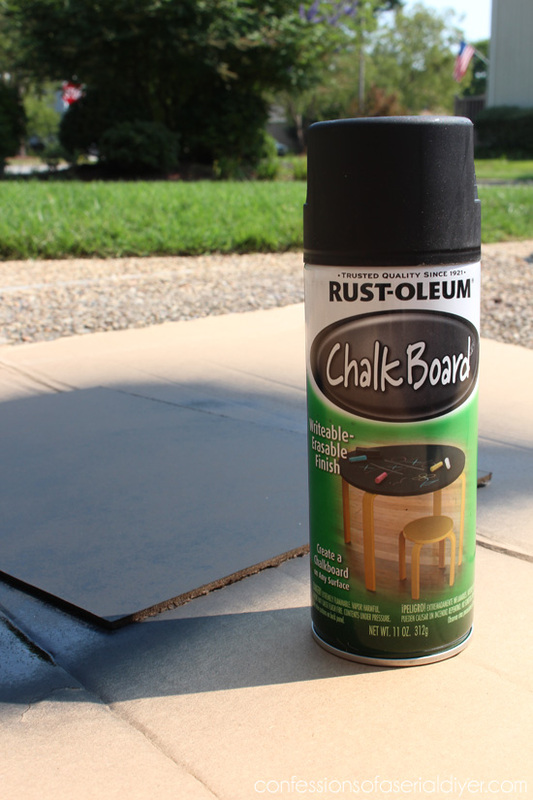 I prefer the spray-on to the brush-on because I like that the spray leaves no brush marks. 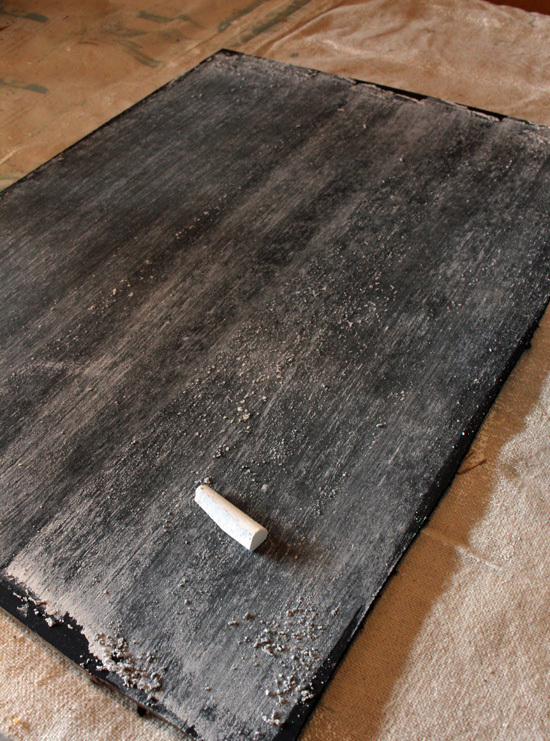 When that dries, you need to “season” the surface by rubbing chalk all over, or the first thing you write will be there faintly forever supposedly. I haven’t tested that theory out myself. Then just wipe it away with a soft cloth. 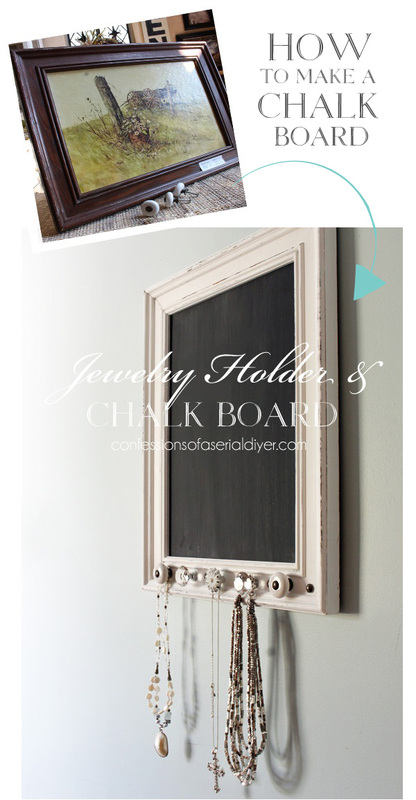 Insert the chalkboard into your frame that has already been painted, waxed, etc. This is the Logan Point Driver that I’ve mentioned a couple of times. This thing makes life so easy if you make a lot of these things. 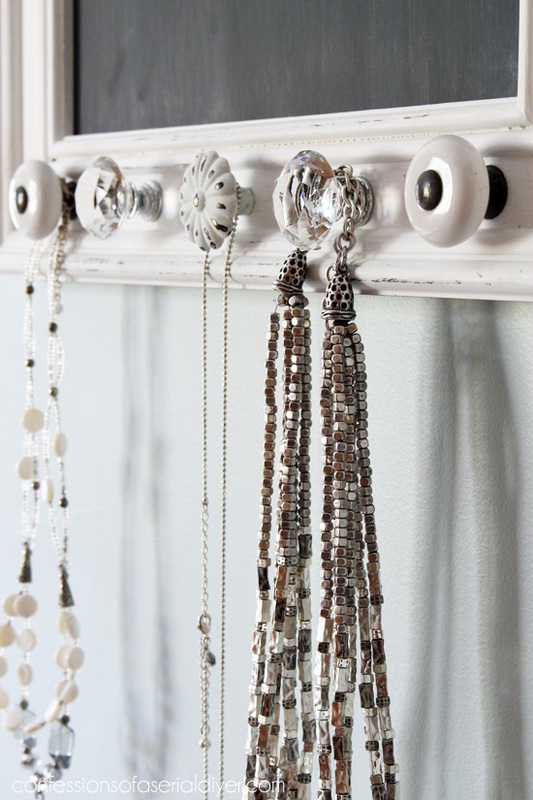 If you don’t have one, don’t worry you can secure it using small finishing nails, hammering them into the frame similarly to how the points are inserted above. And that is it! I don’t love them, but thought I could use them here and there since I use a lot of knobs around here. I used two on this project, along with two pretty glass ones, and the older one in the center that I saved from another project. These all screwed in from behind and luckily the frame was just the right depth that the screws fit snugly. I added upholstery tacks in between for interest. I had planned to go all the way around with them, but those babies are stubborn! 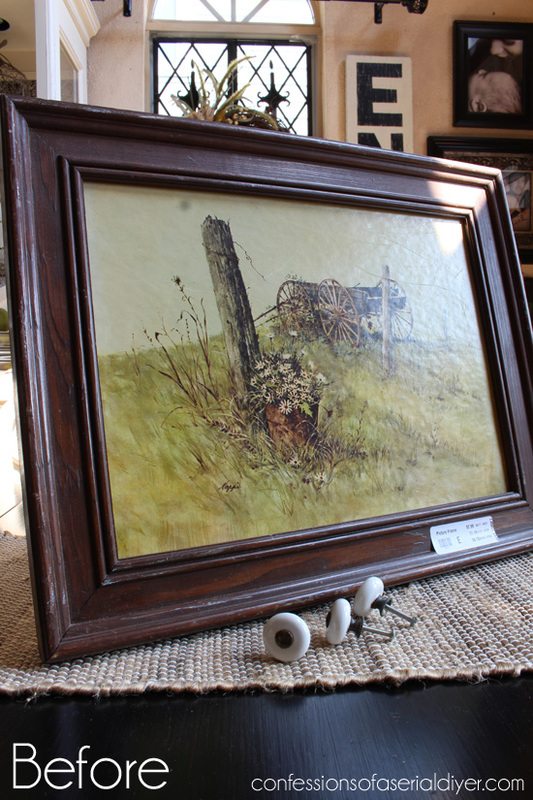 Simple pieces like this are easy sells at my booth. I think it’s easier to justify a purchase if it’s for something that isn’t just pretty, but serves a purpose as well. The little pouch is made from scraps and it holds a couple of pieces of chalk. To finish off the back, I use matte Mod Podge like a glue and apply it with a chip brush to the back of the frame all the way to the edges. Then I add my paper. 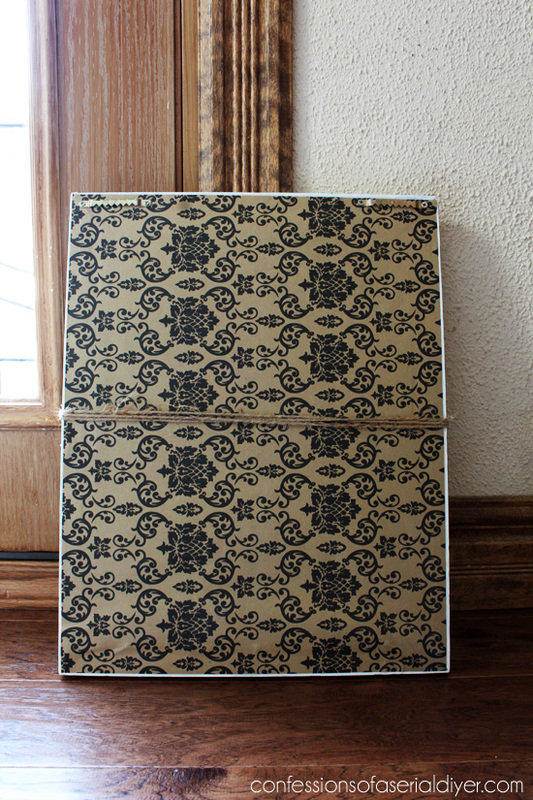 I like brown craft paper for this, but I can often find pretty patterned brown paper at HomeGoods. The one I used here came from Hobby Lobby. I cut the paper on this one to fit before attaching since it was small, but I usually add the paper to one corner then use sandpaper along the edges to remove the excess paper, or a razor blade to trim the excess paper all around the edge. I like these sawtooth hangers that screw in place fro hanging. 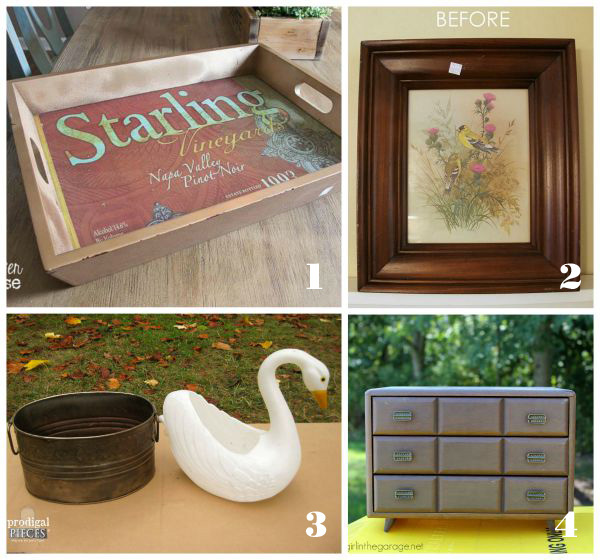 As promised, here are four more fun Trash to Treasure projects to see from my friends below! UPDATE: Just like magic…see it HERE now! I had that picture in my house during the 70’s. It was from Home Interiors. Funny to see it again. Beautiful! And yes, frames… it can be a problem. I’ll do something with all mine someday, I really will! : ) I think I might have a great one for this project! See? 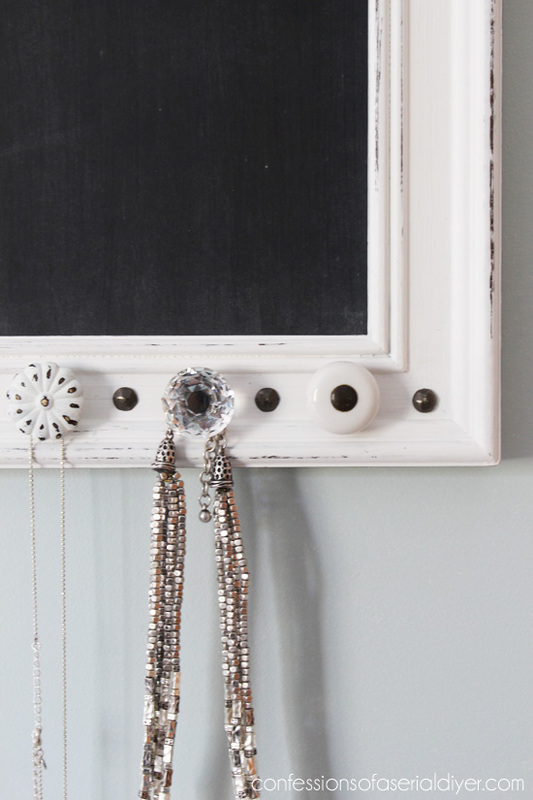 Using the nail head tacks in between the knobs is the kind of small detail that sets your projects apart. I would never have thought of that, but I will now! 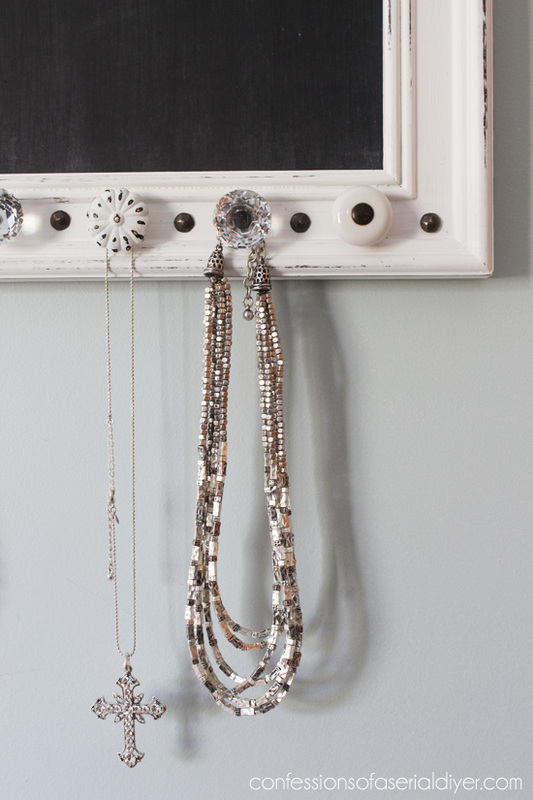 Love it and the knobs! Very nice Christy and what a nice touch papering the backside. 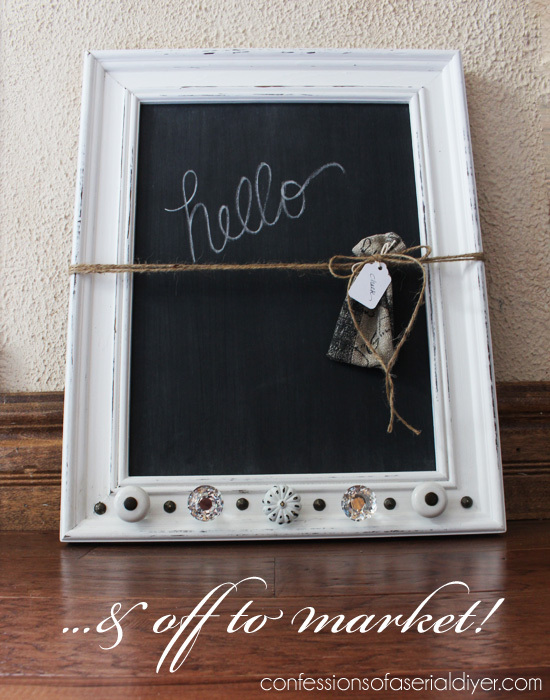 I love the way you package your chalkboards almost as much as the chalkboard itself. I bet they are a hot seller in your booth. This is so clever! 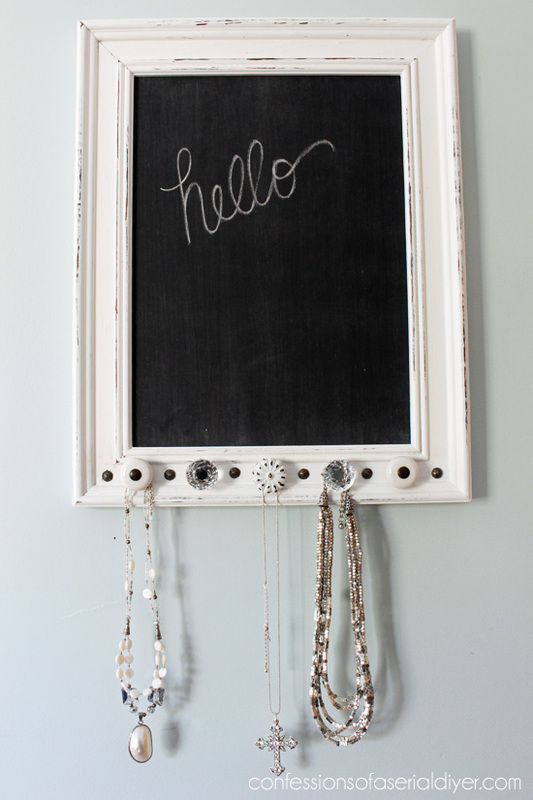 I’m seriously thinking of doing this with one of my frames. 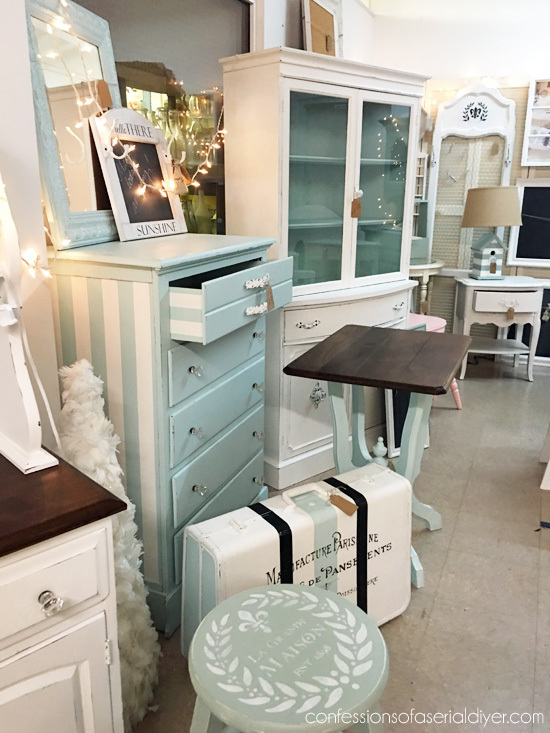 There is a place near me that rents booths and spaces for antiques or vintage pieces. I’m about to find out if I can rent a space to do what you’re doing. 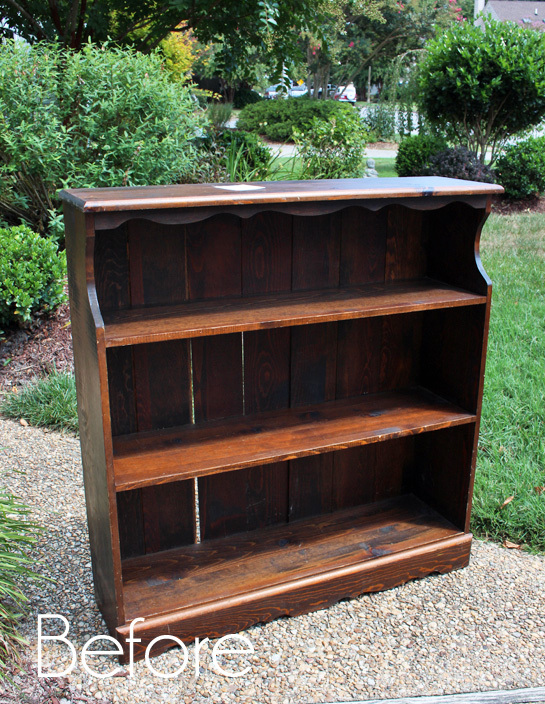 I am an artist and have sold dolls and wood crafts at craft shows and would think nothing of doing a painting for someone, but I’m nervous about refurbishing furniture. I sell vintage items in my Etsy shop and go to estate and garage sales all the time. 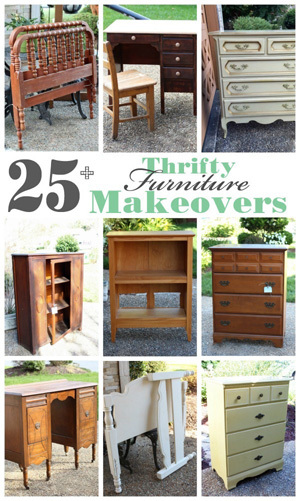 I see furniture I would like to refurbish, but I shy away thinking what if it doesn’t turn out like I envision. Silly, isn’t it? Especially since I’ve done so much in the past and even now. Maybe I should start small like your chalkboard frames, just to get my feet wet and see how it goes. I think I’m afraid that things will not sell because Western NYers can be very picky when buying furniture. I have checked your post where you included prices and I thought your prices were very reasonable. 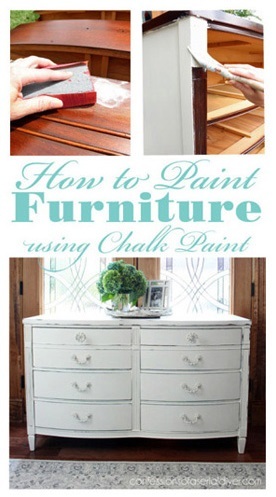 I guess it all depends on how cheap you can get the furniture before you do your magic! Could you tell me how you finished the rear panel – I cannot work out how you got the string on it if it is just the one panel on the back ? 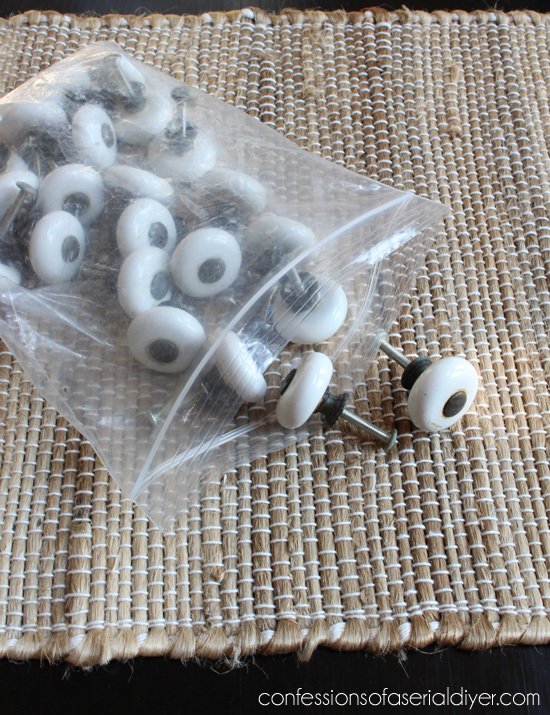 Do you ever just screw in those little hooks with circular ends to each side of the frame, then work string through them ? Hi Christy… again.. amazed at the things you do. 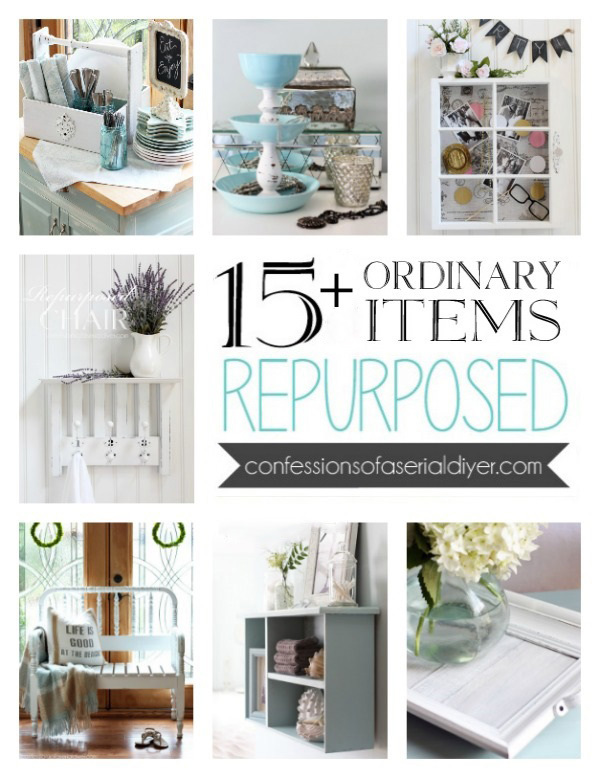 I know this is an old post but I’m relatively new to your blog and am just taking my time drooling thru it. Can you tell me what type of paper you used on the back of your frame? Wallpaper?? Did you apply it with Mod Podge? Thank you again for all your ideas and sharing them with us. I don’t have 1/16 of a stockpile of things to work on like you do… not much in the way of ‘thrift stores’ in the area and have to rely on Goodwill and the selection is not great. I’ll keep searching tho! !